Wednesday is my accustomed grading day, which means Wednesdays don’t typically provide much in the way of interesting blog fodder. Grading papers isn’t thrilling to do, and it’s even less exciting to talk about. To make today’s grading day even less bloggable, it’s been raining all day, leaving me with a case of Blogger’s Block on top of a seemingly bottomless stack of student papers. When it rains, it pours…and it when it pours, you might as well stay inside and grade. 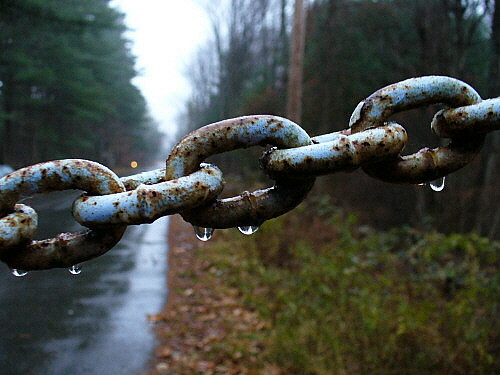 Rain on a rusting metal chain… How wonderfully expressive of the cold, constraining dreariness of day-long rain. Yep, yesterday was pretty dreary…but today it looks like we’re drying out. Nice shot. Do you have a program which will allow you to do incremental straightening? Ideally, I think I’d make that bare tree trunk behind the chain vertical. That’s just a thought, I still like the photo. Thanks for sharing it. Endment, I don’t think I’ll fully recover from Bloggers’ Block until the month of November is over. Between teaching six classes and trying to do NaNoWriMo, my brain is almost empty when it comes to blogging! Gerry, that bare tree trunk is actually a telephone pole, and I think it’s actually crooked in real life! Welcome to NH, where frost heaves jar even utility poles out of the perpendicular.